I have to give Julie the credit for the delicious Teriyaki Sauce that I used in these Chicken Lettuce Wraps. We have used her sauce in Supper Club meals to marinate chicken breasts for grilling, and they are one of our most popular items. Using her sauce as a starting point, these wraps came together quickly and made a great light summer meal. I think they would also be wonderful if you used shrimp in place of the chicken. I’m planning to try that next time. ½ teaspoon dried crushed red pepper flakes (optional), omit if you don't like "heat"
In a medium saucepan, mix all the glaze ingredients together, except the cornstarch, and bring to a slow boil. Take ⅓ cup of sauce and put in a small bowl. Mix with the cornstarch and whisk together. Add back into the sauce and simmer until it thickens to desired consistency, about 5 minutes. If it gets too thick, you can thin with a little water. Set aside. Season the diced chicken with pepper. Heat a large non-stick skillet over medium high heat and add the Sesame oil. Saute the onion and garlic for a few minutes until beginning to soften. Add the chicken and continue cooking until chicken is cooked through, about 5-7 minutes. Stir in the red pepper flakes, if using, cook another minute. Pour the Teriyaki sauce into the skillet with the chicken. Add the lime juice, red bell pepper, green onions, peanuts (or cashews). Spoon about ½ cup of the mixture into a lettuce leaf and garnish with fresh cilantro. Don't let the red pepper flakes scare you. Start with half the amount if you are not sure. We love the little "bite" that it gives the dish. But I am always looking for new twists on old favorites! I love Sesame Oil, and these sound DIVINE!!!! Thanks Tonya! I’ve printed your wraps as well! I just love those flavors. YUMMY! Sounds very yummy and healthy too. You have awesome recipes….and I’m so glad you share them! These sound absolutely delicious. Love that the sauce is made from scratch! Oh – this sounds delicious! Made these tonight for supper and even with accidentally forgetting the lime and leaving off the cilantro, it was amazing! Next time I think I may add some of the baby corn or some sugar snap peas to it too for a bit more crunch factor. Thanks Crissy! I think adding baby corn or sugar snap peas would be wonderful. I have added some chopped water chestnuts before. Thanks so much for visiting and we love your feedback! Have a great weekend! Thanks so much Danielle! We really appreciate your feedback! Have a terrific evening! These look delicious! I was hoping to make these tonight, but I don’t have red wine vinegar on hand. Do you think that rice vinegar would make a decent substitute? So sorry…just saw this. I think rice vinegar would be just fine. Would love to know how they turned out if tried it. 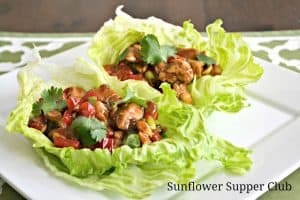 I love lettuce wraps and these look so yummy! I am going to pin this and make these. Thanks for sharing at Throwback Thursday. Thanks Denyse! We enjoy your link party. Have a great week!